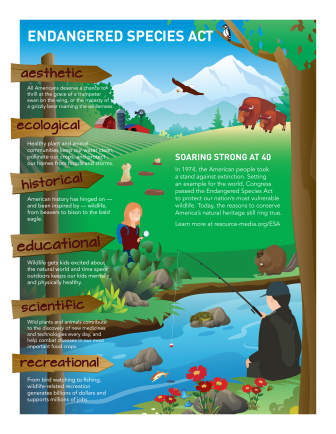 The Endangered Species Act is one of America’s most effective and important environmental laws (Success Stories). It represents a commitment by the American people to work together to protect and restore those species most at risk of disappearing forever. Recent polling shows 84 percent of Americans support the Endangered Species Act, and 87 percent agree that it is a successful safety net for protecting wildlife, plants, insects, and fish from extinction. In 1973, Congress showed global leadership by creating the Endangered Species Act. The Act has been successful – no law has been more important in preventing the extinction of wildlife, including bald eagles, gray whales and the peregrine falcon. And many species protected under the law are on the pathway to recovery. But worldwide, plants and animals are disappearing at an alarming rate, and the natural systems that all species, including humans, depend on are at serious risk. In the United States alone, scientists estimate that more than 500 species have disappeared in the past 200 years. Unfortunately, some in Congress appear willing, even eager, to break our nation’s promise to future generations to protect our natural heritage. The Endangered Species Coalition works hard with our congressional allies to defend against bills and riders that could undermine the Endangered Species Act. Some of these legislative attacks could prevent citizens from taking action to hold the government accountable for failing to adequately protect our most imperiled species. Others would carve out exemptions for particular species or geographic areas as giveaways to special interests, including some of the wealthiest oil companies, big agribusiness, and land developers. From protecting black-footed ferrets to sea turtles, the Endangered Species Act has been critical in the battle to save our most imperiled species. In addition, the Act provides numerous conservation resources to help states, tribes, and private landowners. Since it was signed into law in 1973, the Endangered Species Act has afforded protections to more than 1,400 species in the United States, and many are on the pathway to recovery. Just as important, millions of acres of forests, beaches, and wetlands—those species’ essential habitats—have been protected from degradation. The Endangered Species Act is designed to protect not only large, charismatic wildlife such as grizzly bears and bald eagles, but also species that are more obscure, yet equally unique and critical to the web of life. The Act protects the ecosystems upon which imperiled wildlife and many other species, including humans, depend. By creating the Endangered Species Act, Americans stated that it’s not enough that wildlife survive in the sterile confines of zoos—they declared that these species should also thrive in natural environments. The Endangered Species Act was signed into law by President Nixon in 1973; it has been in force for more than 40 years. The Act aspires to prevent extinction, recover imperiled plants and animals, and protect the ecosystems on which they depend. The U.S. Fish and Wildlife Service (FWS) and the National Marine Fisheries Service (NMFS) are the two federal agencies responsible for implementation of the Act. For a species to gain protection under the Endangered Species Act, it first must be listed by regulation as either “threatened” or “endangered,” the most vulnerable category. A proposal to list a species can arise from a petition submitted by the public or state agencies. Sometimes FWS/NMFS determines that listing a species is “warranted but precluded” by the need to list other higher priority species. The species then becomes a “candidate” for listing, a designation that offers limited protection under the Endangered Species Act. When FWS/NMFS lists a species, it generally must also designate “critical habitat,” which are specific areas with the physical and biological features that need special management considerations or protections essential for the species’ conservation. In addition to critical habitat designation, a listing typically requires development of a plan that spells out the research and management actions necessary for a species’ recovery. Each federal agency is required to conserve listed species and to ensure that the agency’s actions are not likely to jeopardize the continued existence of these species or adversely modify or destroy their critical habitat. If a federal agency (the “action agency”) proposes to authorize, fund, or carry out an action that may affect a listed species or its critical habitat, it must consult with FWS/NMFS. (Activities on private land with no federal involvement do not require consultation.) After consultation, the Fish and Wildlife Service issues a “biological opinion” stating whether or not, in its view, the proposed action is likely to result in jeopardy or adverse modification. If the Service finds that either impact is likely to occur, it may propose modifications to the action to avoid violating the Act. While the action agency can disagree and reject the Service’s conclusion or recommendations, it does so at its own peril, as courts tend to defer to the wildlife expertise of the Fish and Wildlife Service. These plans are designed to reconcile land use or development with listed species conservation. An HCP negotiated with a developer, land owner, or state or local government describes the anticipated effects of proposed activities on certain listed species, includes a list of conservation measures to minimize and mitigate the impact of incidental takings as much as is practical, and lists the funding available to implement the plan. When the HCP is approved, FWS issues an incidental take permit which absolves the applicant from liability under the Endangered Species Act for harm to the species. These agreements are intended to shield landowners who voluntarily manage their lands for the benefit of candidate species from additional land-use restrictions if the species is subsequently listed. Landowners receive assurances from FWS that if the species is listed, they will not be required to take any conservation measures beyond those to which they have already agreed. Under these proactive agreements, landowners voluntarily agree to enhance the habitat of listed species on their properties and, in return, receive assurance they will not be required to take any additional conservation measures other than those to which they have already agreed. Participating landowners also receive assurances that they will not be burdened with additional restrictions on the use of their properties because of prohibitions on incidental take, should the population of the listed species increase on their land.